Citrus gall wasp is a pest that affects all citrus species. Citrus tree owners are encouraged to implement control measures on their property to reduce the threat to the citrus industry in Western Australia. Citrus gall wasp (Bruchophagus fellis) is an Australian native insect from northern NSW and Queensland and now established in some Perth suburbs. 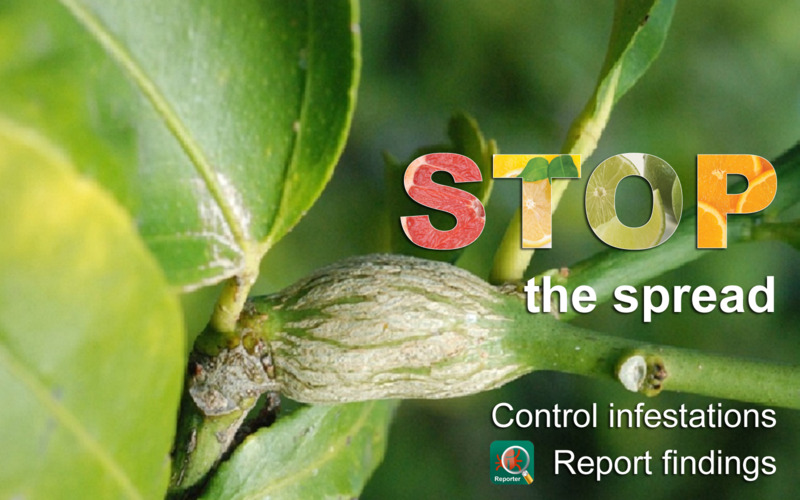 Preventing the spread of citrus gall wasp will help commercial and home citrus growers. The local citrus industry will be able to keep production costs down and home owners will be able to enjoy the fruit they have cared for. The spread of citrus gall wasp into orchards and backyard citrus trees is usually the result of the introduction of infested citrus plants and the lack of monitoring of gall development in branches. Citrus gall wasps have a limited flying range meaning that infestations within a property occur by the close presence of infested citrus trees, including across the fence of urban properties. Spread over long distances is facilitated by the wind and by movement of infested trees or by untreated infested branches. The wasp produces characteristic woody galls which form around the developing larvae. Monitor for its presence between June and September (winter-early spring). New-season galls start to become visible in April and are easy to see by June. The best time to check for and remove galls is during June and July. Search for forming galls on young, green twigs. Galls located further up the branch or on older branches can indicate that there have been older infestations (previous year or earlier). The presence of holes within the gall indicates that adults have already emerged. Inspect for the presence of galls in all nursery stock and new plants prior to and after planting for at least 12 months. Check for galls on established trees all year round. Prune out branches affected by galls. This is essential for controlling the gall wasp. Prune and remove as many galls as possible in June and July each year. Treat affected branches before disposal: Wasps can emerge from galls in pruning offcuts if pruned too close to the usual emergence period. Galls removed after June should be shredded and solarised or burnt and deep buried. Solarise galls by placing them in a well-sealed plastic bag, preferably by double bagging, and sitting the bag in the sun to bake for at least four weeks. Disposing of gall offcuts in normal household waste, a green verge collection or in garden bags can spread the pest to other areas. Avoid heavily fertilising trees in winter or spring. Over-fertilising (particularly heavy nitrogen applications) can promote excessive amounts of spring growth that the gall wasp prefers. The wasps Megastigmus brevivalvus and M. trisulcus insert their eggs directly into the egg where it slowly develops in the host larva, eventually killing it. DPIRD has released these parasitic wasps in 2015 to determine its potential establishment as a biocontrol agent in Western Australia. The effectiveness of insecticides depend on the timing of application and severity of the infestation. Always follow label instructions, withholding periods and permit conditions (APVMA portal). Confidor® Guard (Imidacloprid) is a systemic soil-applied insecticide registered for the control of citrus gall wasp in commercial orchards. Samurai® (Clothiandin) is another systemic soil-applied insecticide registered (under permit) for the control of citrus gall wasp in commercial orchards. Movento® (Spirotetramat) is used to control a variety of citrus pests and can significantly reduce galling. Although petroleum spray oils are used against other citrus insect pests, citrus growers can use them to deter gall wasp adults from laying eggs. NSW trials with calcined kaolin clay (Surround®) show promise to disrupt egg laying and reducing galls. Apply at least twice during spring when wasps emerge. NOTE: Pesticides are extremely disruptive to integrated pest management and organic food production. Timing of control actions varies with locations. Follow citrus tree development suited to your region. Use MyPestGuide reporter app or web tool — go to mypestguide.agric.wa.gov.au or call the Pest and Disease Information Service on (08) 93683080.